229 p., 14,7 x 20,8 cm. With contributions by Hermann Beland, Georg Bruns, Hanna Gekle, Jonathan Sklar, Claudia Thußbas, Dorothee von Tippelskirch-Eissing, Peter Wegner, Uta Zeitzschel and Karin Zienert-Eilts. Whether in casuistic seminars, infant observation groups or supervision groups, the group is a decisive factor in learning psychoanalysis. Balint groups make it possible to understand unconscious (counter) transference in human interactions and to have this incorporated into other occupational groups. Once the underlying theories have been explained, such as for example in the case of Wolfgang Loch and the Group Relation Conference, a triangulating function is ascribed to the group. Against this backdrop, the volume presents case histories and results gathered in various clinical groups. There are descriptions of single psychoanalytical case studies, group discussions and comparative theoretical reflections as well as thoughts on the sociopolitical relevance. Some results of the sixth group relation conference about »The Past in the Present« are reported in detail and discussed. The special importance of this conference lay in the extension of its dynamic on the actual bloody conflict between Palestinians and Israelis. The primary task of this tense triangle between Germans, Israelis, Palestinians had been Enmity. The transference movement in a Small Study Group (SSG), after an explosive first session, led to peace in the group, which movement seemed to have a model character of societal peace processes. The hypothesis was that collective Enmity might be compounded of individual self-destructivenesses. The alpha-function of SSG + consultant transformed the individual problems after having been confided to the group (»usefulness of the uselessness«). On the other side, the meeting of sub-groups of the System Event did not happen. These meetings would have represented the chance of alpha-processes working on the atrocities in the society at large. The amount and intensity of anxiety as much as the demands on members’ anxiety-tolerance were much to high (»outside is the massacre«), being the second result of the conference. Both results allow for further discussion of the extension of Bion’s alpha-function on society at large which is doubted. This text describes differing reactions, encountered by the German author in her work as a ›German consultant‹ in two international group relations conferences in Israel, the members of which were mostly coming from Israel or were of Jewish background. The problem of otherness was both referring to the otherness of her role as consultant as well as to the otherness of backgrounds regarding the differing nationalities of the participants. The material presented can be conceptualized on different levels: On the one hand there is the encounter between the differing members of the conference and ›the German consultant‹ regarding the context and the overall frame of the conference. However, this constellation also resonates with the traumatic historic nucleus, that may well be inherent in any encounter of Israelis and Germans; and furthermore, viewed from the perspective of the philosophy of Emmanuel Lévinas, in any encounter of differing human beings. Emmanuel Lévinas has described this traumatic encounter with the other as stringently leading to a relationship of responsibility towards the other. From this background the ever present transference and counter-transference relationship is open to additional perspectives to be discussed here. In The Doctor, his Patient and the Illness (1957) Michael and Enid Balint describe discussion groups for General Practitioners at the Tavistock. Their work always focusses on the problem between doctor and patient – this is the countertransference of the doctor. The group enables, through its ›free associations‹, knowing more of the presenting doctor’s unconscious state of mind in relation to the impact of the patient. This brings relief from the doctor’s sense of clinical impossibility and leads to new forms of clinical creativity with ›stuck‹ patients. This methodology is profoundly different from supervision of case material where the centre of work is understanding the patient. The Balint methodology melts the psychic with the somatic, with the potential to understand the impact of the patient’s early environment on his or her character as well as the physical and mental forms of presentation to their doctor. In Part 1 (Jahrbuch der Psychoanalyse 76, 2018) – using clinical material from Mr S’s recent medium-frequency analysis, as well as the complete illustration of the 103rd session – some microprocessual relational elements were excerpted that had been generated in a series of seminars (2006 to 2013) by Joachim F. Danckwardt, Ekkehard Gattig and Peter Wegner: ›synchronisation‹, ›self-efficacy‹ and ›recombining pathological self-organisation‹ (cf. Danckwardt/Schmithüsen/ Wegner 2014). 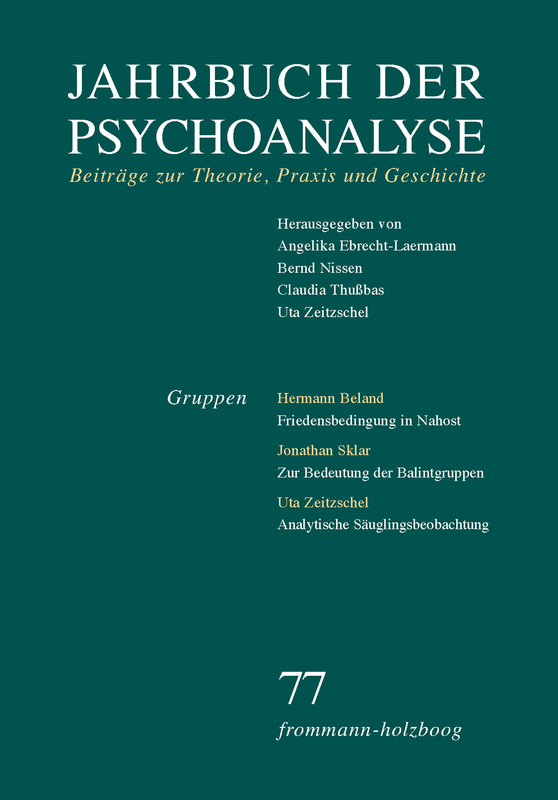 For Part 2 of this paper, the same 103rd session with Mr S was presented in a psychoanalytic seminar to colleagues from the Karl-Abraham-Institute of the German Psychoanalytical Association (DPV) in Berlin and was discussed in detail by the group in terms of the Wolfgang Loch method. Using an anonymised (part-)transcript from this seminar session, the progress and results of the discussion are interpreted and compared with the results of the individual case study in Part 1. It was also possible to generate from the discussion of the ›Berlin seminar‹ a further ›micro-process‹ of the patient–analyst interactions and, with reference to Jonathan Lear (2002), to define this as ›break‹ or ›disruption‹ (›Unterbrechen‹). The paper concludes with a few considerations on treatment technique, and an epilogue that gives some information about the subsequent fate of Mr S, the patient whose case was presented. The paper describes a one-year analytical infant observation and the work in the accompanying seminar group. The infant observation affords the experience of the existential dependency of the baby, its early anxieties and defences, the alternation of projection and introjection, and the close relationship between the body and the developing psyche. The diverse, emotional and at times extremely intense impressions during the observation can be contained and further understood in the seminar group. Here, a level of reflection is created whose triangulating function is of great importance for the baby observer, especially when the third position is lost in the momentarily charged emotional event. The author describes that the infant observation is generally characterized by the dynamics of the early oedipal situation, and explains why the experience of infant observation can be a valuable part of general psychoanalytical training. This paper deals with the role of the group of training analysts in psychoanalytic institutes. It shows that this group owns special power and influence deriving from its historical task to safeguard psychoanalytic doctrine according to Freud and to maintain the psychoanalytic movement. The chair of the group becomes the informal director of the institute because of the training analysts’ special task. He steps at the side of the formally elected director. This constellation induces special group dynamics. It refers to the fact that psychoanalysis in its history and in what it stands for is at least equally a socio-professional movement and a science. The importance of training and of the training analysts’ group in an institute becomes evident with an educational conflict which lets the whole institute change from the state of a work group to that of a basic assumption group in the sense of Bion. To belong to the group of training analysts and to the institute allow narcissistically important ties to psychoanalytic institutions, which often remain unnoticed and unconscious. These ties can influence the analysts’s work with candidates. Therefore, the training analyst needs to have at his disposal the function of double ego-splitting in order to achieve an open, neutral attitude. Double ego-splitting consists of therapeutic and institutionally related ego-splitting. Framed by Sigmund Freud’s explanations on »Why War?« the author asks how in a western democratic society destructive populistic group processes can be understood. In bringing together the explanations of Wilfred Bion, Herbert Rosenfeld and Otto Kernberg the author sketches the outlines of the origin of destructive populism, understood as a destructive container, taking Donald Trump’s campaign speeches 2016 as an example. Although paranoid projections, hatred and devastating rage in the mode of the paranoid schizoid position are taken in by this container (Bion 1990), they are not digested, decontaminated or mitigated, but, on the contrary, stimulated. In escalating group and mass processes elements of a destructive narcissism (Rosenfeld 1971) are reinforced. Unfortunately, in a closed system they are re-confirmed again and again and thus hinder any development. With reference to Freud’s concept of »paranoiac mechanism«, Ernst Bloch’s writings make it possible to define the difference between a fully elaborated system of paranoia and a partial paranoiac foreclosure (repudiation). Whereas a system of paranoia ultimately prevents all sublimation, partial foreclose may result in a specific form of creativity. The content of the foreclosure is, primarily, the signifier »father«. Excluded from consciousness, it manifests itself partly in image form, partly as a gestalt of external reality, and is seemingly impossible to distinguish from external reality. But the affect discloses the psychological genesis. With his concept of the »not-yet-consciousness« developed in 1918, Ernst Bloch described the phenomenon of creativity as being the opposite to repression – in the creative process, things that have never been expressed before come into existence. In order to present this new content, Bloch chose a new form of expression. Instead of staying within the format of categorial-philosophical thinking, he switched to literary narrative. Wolfgang Loch also noted the emergence of something new, but he analysed it within the psychoanalytic process.